Eltham Wildcats would like to invite suitable individuals to apply for a coaching position with the Eltham Wildcats Boys Championship Programme for the 2018/19 season of the Victorian Junior Basketball League. 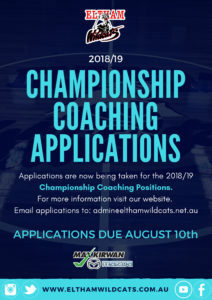 To apply, please download and read the Coaches Application Form below and submit the application by emailing admin@elthamwildcats.net.au with the included Subject line: “Boys Championship Coaching”. Please note that applications for all teams are due by August 10th.